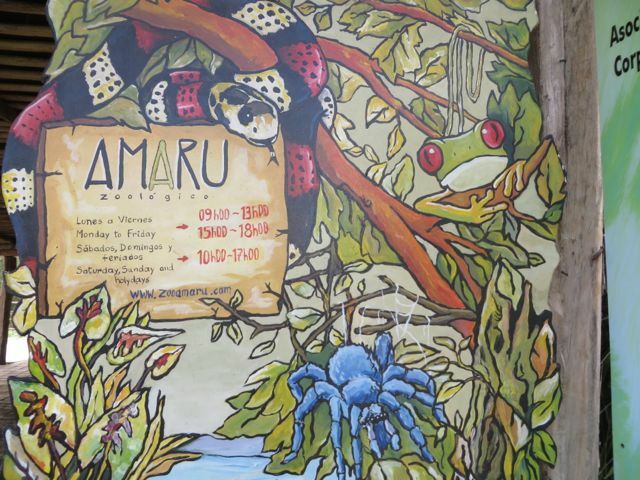 Amaru: A day at the Cuenca Zoo! I’ve been checking out the Trip Advisor reviews of Cuenca’s Amaru Zoo for the past couple of months. Most people love it. Some hate it. People who hate it tend to be of more advanced years, tend to have very young children, or have some very different expectations. How could a zoo NOT be a place for young children, you might wonder? Imagine a zoo built into the side of a mountain where you scramble up steep trails, over tree roots, then duck under chicken wire as monkeys, birds, and tigrillos (little tiger-like cats) threaten to poop on your head. If you like that kind of stuff, this is the place for you. We loved it, of course. But this is not a zoo where people can push strollers around and nibble on peanuts and cotton candy. In fact, food is only allowed in the designated rest area – or you risk getting mugged by the little monkeys that roam freely through the park. This gives you a feel for the nature of the main trail through the park. 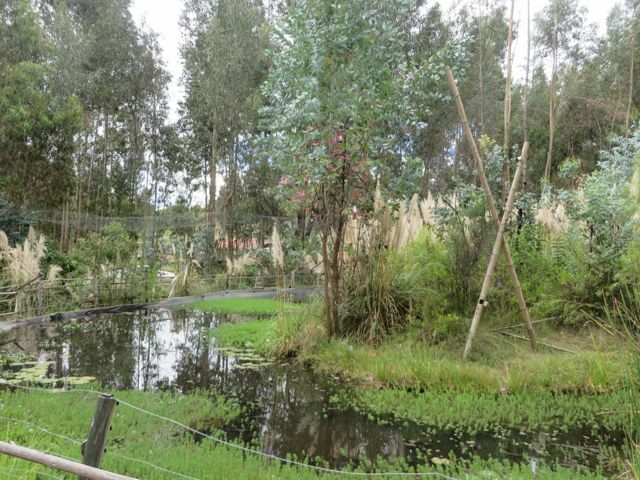 The Amaru Zoo is perched on a hill on the outskirts of the city of Cuenca. The zoo designers have set up chicken wire of various sorts to confine the animals in places they thought they’d be happy. 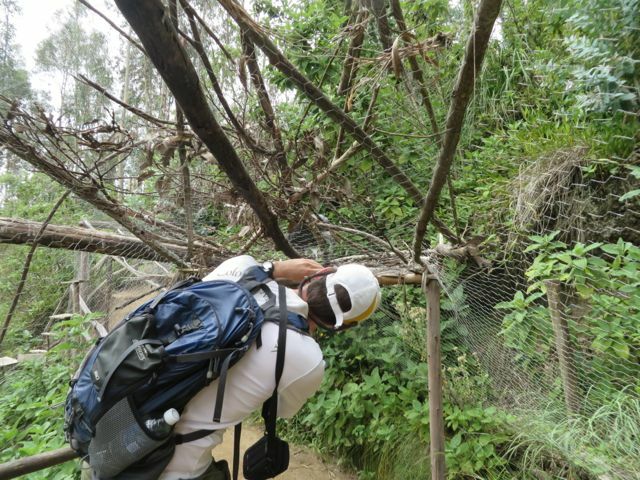 There are even chicken-wire tubes that allow some of the animals (the monkeys and cats) to travel around the eucalyptus enshrouded hillside and check out what’s happening in other parts of the park. 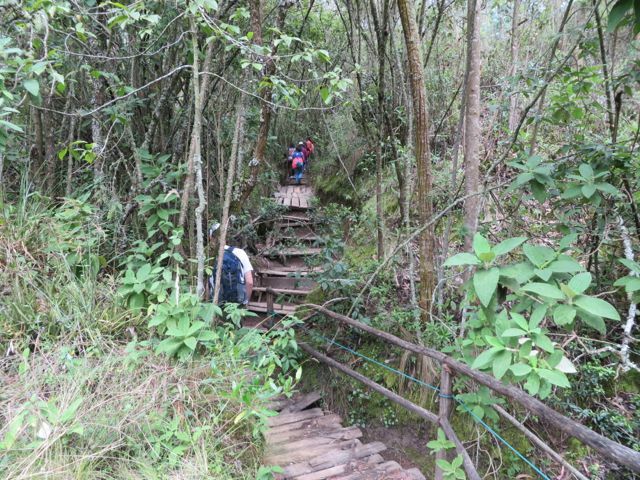 For the human visitors, there are trails carved into the mud and dirt around the ‘exhibits’, and, in some places, make-shift wooden stairs and walkways. 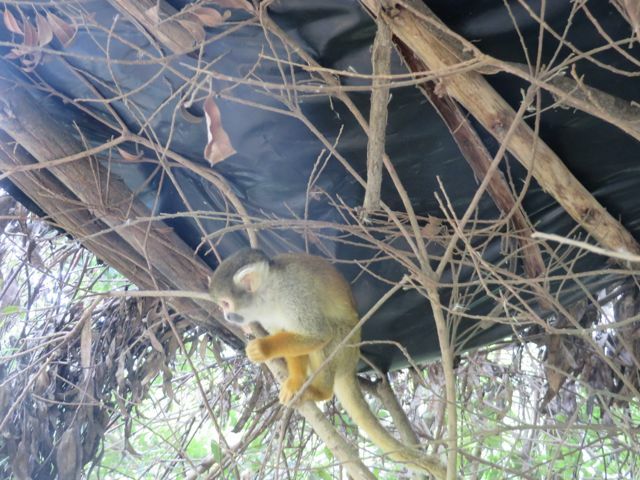 While most of the monkeys are confined to certain areas of the park, these little guys roam around freely – and they are very eager to see what you have inside your bags. From the entrance, you follow a 2km trail – from which it would be difficult to back-track, if you needed to. This is a challenging trail, and in the rain, it would become slick and muddy very quickly. Considering that you’re also at around 8500 feet, it’s not for the faint of heart. I already mentioned the tree roots, but you might also find yourself walking along planks laid down in the muddiest sections. You will go up and down steep hills, and (for those of us ‘taller’ folks) you will have to walk in a semi-crouch as the trail leads you through a human-sized tunnel of chicken wire through a bird aviary. Walking through the human-sized chicken wire tunnel in the bird enclosure. Hoping we don’t get pooped on. 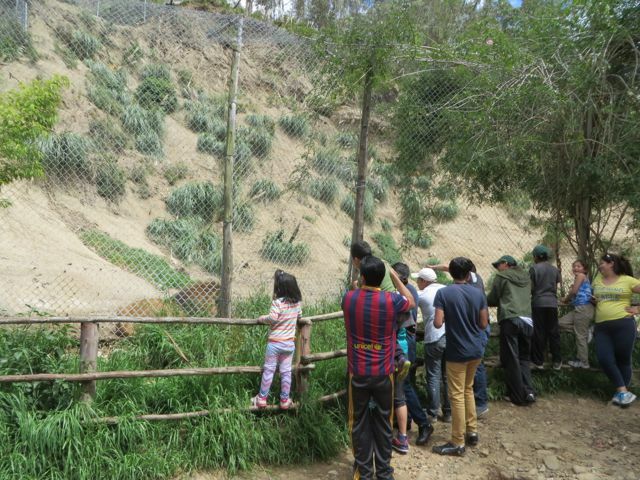 The animals were just as fascinating as the trail and spectacular views it offers of the city of Cuenca. While this place is billed as a zoo, it is really an animal sanctuary. Most of the animals have been rescued from other zoos, or really unpleasant situations. None of them are in a position to return to the wild. 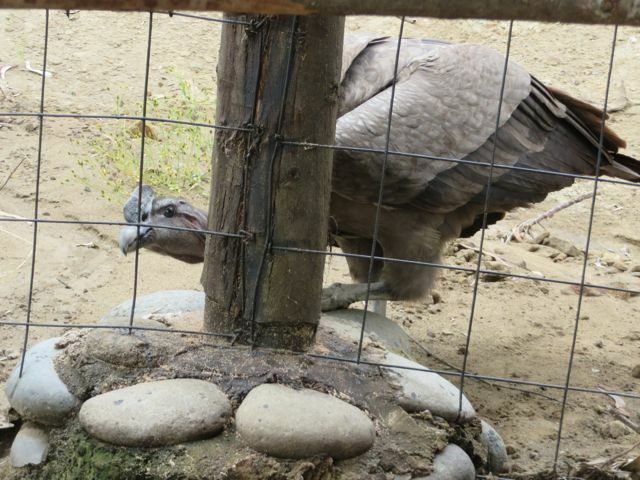 The Andean condor, peeking at me from behind the fence post. This guy was shot in one of his wings some time back and is unable to fly. He spends his days watching the crazy humans pass by his enclosure and posing for photos. 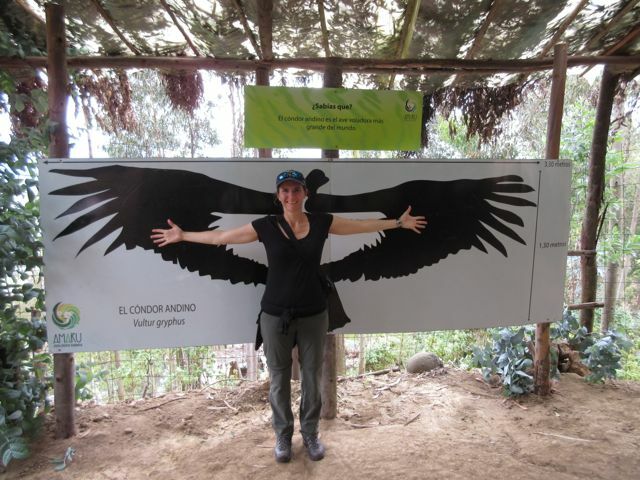 Just to give you an idea of how big the Andean condor is. Amaru has tried to create as close to a natural setting as they can for these animals. They are mostly South American animals, with a couple of ostriches and a group of six lions to round out the usual set of large African mammals. Monkey island, surrounded by a moat. In the background, you can see some of the chicken wire tubing between the trees that allows the monkeys roam around the park. 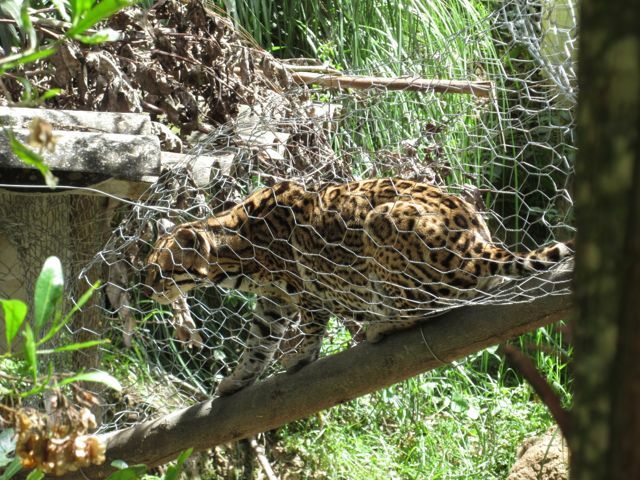 A tigrillo moving about in one of the chicken-wire passage ways designed to let her roam around beyond her primary enclosure. 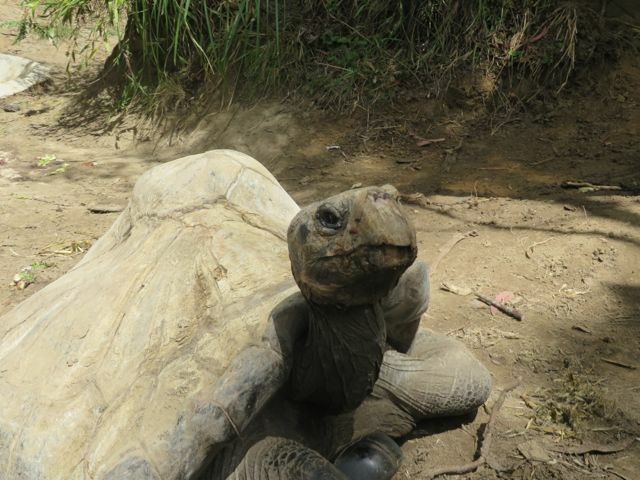 This Galapagos turtle has been through some rough times, judging by the odd shape of his shell. I’ve never been so close to a predator as I have been at this zoo. 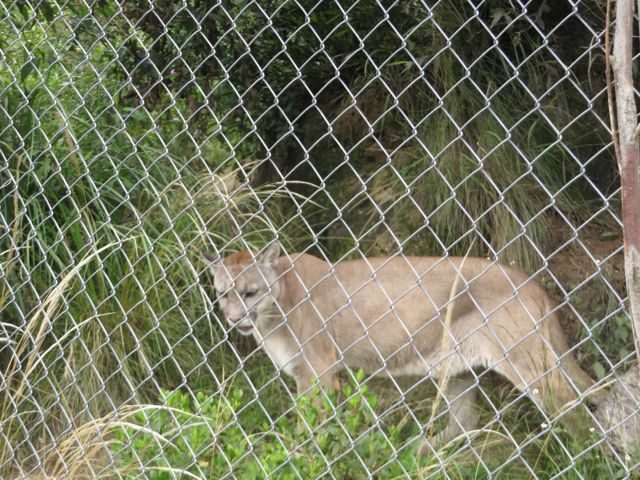 Walking past the mountain lion enclosure, we were peering through the cage and the dense vegetation, trying to discern movement, when the cat walked right out of the greenery immediately in front of us, practically without a sound. With nothing more than 2 feet and, basically, a gate between us, I felt a rather mighty adrenalin rush. I really hope I don’t ever encounter a mountain lion while hiking in Colorado. Oh, hello kitty. Who’s a good kitty? The highlight of our visit was lunch time in the lion enclosure. Amaru cares for six lions: four females and two males. At 1 pm each day, they get fed. 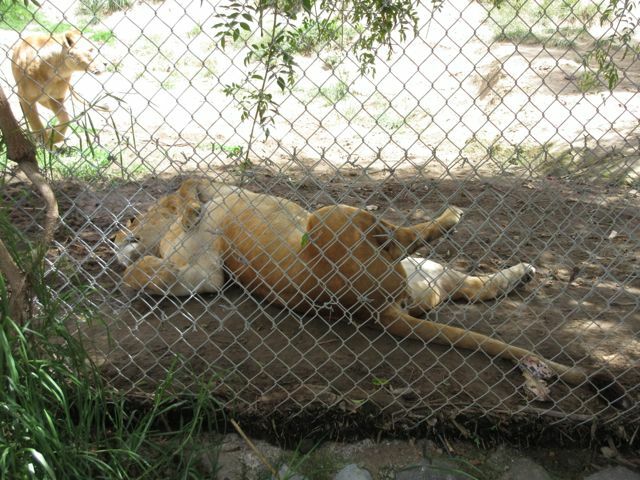 Prior to feeding, the lions are required to go into a little holding pen, so the zoo employees can get into the lion enclosure to deposit the food. Most of the lions make a mad dash for the holding pen as soon as the gate opens, in the same way my own cats will come running at the sound of a can opening. But one of the male lions was a bit stubborn and decided to take his time. The zoo handlers tried to coax him with a bloody calf leg, and he gave some grumpy roars (again, not all that unlike one of my own cats, when I get home from work late and he hasn’t eaten). I often see my own house cats in this same pose. When they finally got him to agree to enter the holding pen, they wheeled in a barrow full of calf parts, and hid the juicy nuggets (as the lions might call them) throughout the enclosure, behind tufts of grass, bushes and trees. The moment they freed the lions from the holding pen, I felt like I was watching Animal Planet live. The males butted past the females and tussled with each other a moment to see who got to have the choice pieces left in front of all the human viewers at the base of the enclosure. The females just tried to avoid the males, grabbed whatever they could find, and made their way to the higher reaches of the enclosure where they could eat away from the interference of anyone else. The largest male settled down to gnaw on some bones right in front of a crowd of human spectators. I think he liked the attention. Spectators with cell phones watching the dominant male lion eat his lunch. The zoo also displays some rather graphic exhibits that really hit on the impact of humans on the environment. And when I say ‘graphic’ I mean ‘not fit for young children’. In one exhibit, you hike through a part of the forest where they demonstrate the effects of deforestation. Some of the eucalyptus have been cut down and dotted with red paint so you can associate deforestation with bloodshed. And just in case that doesn’t drive the message home, there are gory artist’s renditions of animals with their heads chopped off, lying next to downed trees. Couldn’t bring myself to take a photo. DEFORESTATION = DEATH. We get the message. In another exhibit, you hike past piles of trash, and a bulletin board discussing the mid-ocean garbage patches. This exhibit was a little more hopeful, with demonstrations on how we might effectively use plastic and tires in other ways. 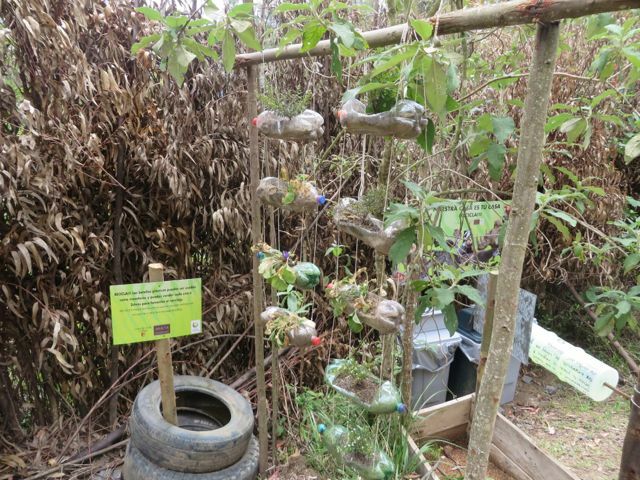 Demonstration of how to use old plastic soda bottles to build hanging planters. One last thought: as we walked through the zoo and took note of just how little was separating us from some rather amazing predators, we kept thinking how almost everything about that zoo would result in a major lawsuit back home. This is especially so in places where you could easily stick your fingers (or even an entire arm) through a cage if you really wanted to pet a monkey, for example. But unlike in the US, in Ecuador, if a monkey bites off your finger, it’s considered your own fault for being stupid enough to let him do it. The Ecuadorians aren’t required to protect people from their own stupidity. 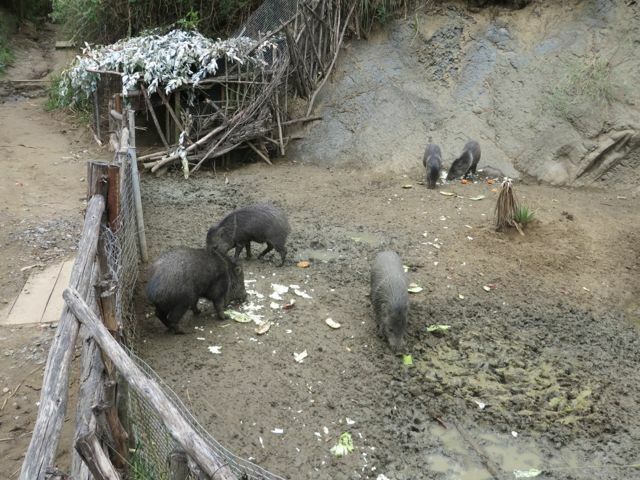 Peccaries eating their lunch in the peccary enclosure. Note that there is nothing that would actually prevent someone from leaning over the short fence to pet one of these guys – nothing but common sense, anyway. Try to visit in the morning – or on a dry day. I wouldn’t want to hike these trails when they’re muddy. A taxi ride to/from the zoo from central Cuenca will cost $4-6. Look up the location first, so you can explain to the taxista in case he doesn’t know how to get there. The staff at the zoo office will happily call a taxi for you when you’re ready to leave. You could take a city bus out to the hospital on the east end of town near the zoo, but it would be a LONG hike up a steep hill (not to mention the challenge of crossing a freeway on foot). Zoo entry fee is $4/adult. Cheap enough to make the taxi worthwhile. Supposedly you’re not allowed to bring in backpacks or bags…But no one said anything about ours at the entrance. In case you’re told you can’t bring it in, I noticed they have a bag-check system. Americans could definitely learn from Ecuadorians about not trying to protect people from their own stupidity. That zoo definitely looks interesting. They sure put a lot of trust in their chicken wire! Glad you’re having a good time.